Our courses provide uniform instruction in the basics of of ice skating whether your goal is figure skating, hockey or just recreational skating. The program is designed to be fun, challenging and rewarding. We welcome skaters of all ages – tiny tots to adults! Classes are grouped by age and skill level. All beginner skaters start in Level 1. Kids that are interested in playing hockey must complete Level 1 and Level 2 before getting into the Hockey 1 class. CLICK Here to Register for Spring Learn to Skate! CLICK Here to Register for Spring Learn to Play Hockey! Moylan Iceplex is proud to announce we are teaming up with NXTLevel Hockey Academy. Go to https://www.nxtlevelhockeyacademy.com to sign up! Looking to get into skating or hockey but dont know how to skate? Want to learn in a group setting with other adults? We have a class for you! Classes will be held on Tuesdays from 6:00pm-7:00pm and Saturday mornings from 10:15am-11:15am. 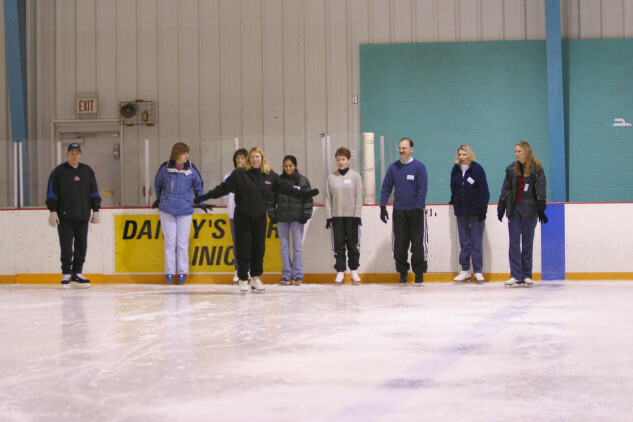 While there will be people of all ages on the ice your class will only have adults in it. Moylan Iceplex is excited to announce that we are now offering an Intro to Figure Skating Off-Ice Class. The class is one hour long and will focus on fun participation and basic skills development. Are you an adult looking for a way to improve your hockey skills at a reasonable cost? Look no further then our Adult Skills Fantasy Camp. The game of hockey requires time and dedication to get better. Regardless of your playing level, there is always room to improve and learn more from some of the best in the field! We look forward to coaching and helping you with your game this summer. Camp will be held on Tuesday nights from 7:00pm-8:00pm.